File contains a special edition of the Globe and Mail Magazine, February 15, 1969 concerning Blacks of Canada in historical and contemporary perspective. File contains The Intelligencer Weekend Magazine from Feb. 17, 1968 with the headline “Canada in the Year 2000”. 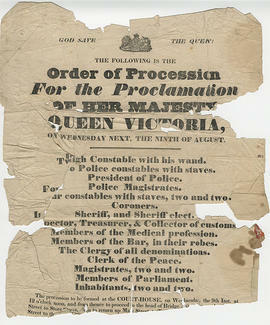 File contains an original printed poster announcing a procession on 9 August 1837 to mark the proclamation of Victoria as Queen. File contains a pamphlet depicting the floral emblems, coats of arms and flags of Canada, the provinces and territories. File contains several newspaper articles concerning the unifying of Canada's Armed Forces in February, 1968. File contains a newspaper clipping commemorating the centennial of the Eaton's catalogue in Canada. Recording of 'O Canada' made for the 1976 Olympic Games. File contains a newspaper article concerning the career of His Excellency Roland Michener, Governor-General of Canada. File contains a newspaper article with portraits of Royal Governors of New France and Governors-General of Canada from 1608 to 1898. Note on file also refers to an article on verso regarding vaccination legislation in England. Hastings poll results : election June 25, 1968. File contains newspaper clippings concerning candidate selection, polling results and election outcome for the 1968 Federal election. File contains a printed booklet, titled Huguenot Trails, which includes information on early Huguenot settlement in Canada. 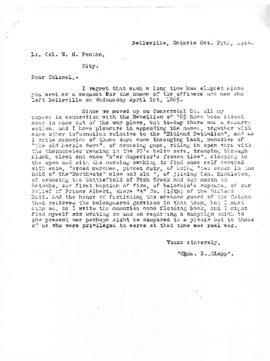 File contains a newspaper review of An Uninhibited History of Canada by Eric Nicol. File contains a newspaper article profiling Judy La Marsh, Liberal MP for Niagara Falls. File contains a newspaper article from the Ottawa Journal concerning the life and political career of the Hon. Sir Wilfrid Laurier.